At under $300 a device, Chromebooks are an attractive alternative to pricier laptops and tablets. Learn everything you need to know about deploying them from two districts who have taken the plunge. To date, Richland School District Two has deployed almost 15,000 devices, most of them Chromebooks. Visit the Website for the Richland School District Two in Columbia, SC, and you will see the district’s motto proudly displayed on every page: Inquire. Ignite. Inspire. They are not mere words. The district tries to put those goals into action with all aspects of its educational strategy. And according to Technology Integration Coordinator Donna Teuber, they are also fitting descriptions of the Chromebooks experiment there, and the interest it has brought from other school districts. Teuber’s district includes 18 elementary schools, seven middle schools, five high schools, four magnet centers, and two alternative centers. Richland Two became a Google Apps for Education user in July 2011; and immediately afterward launched a 1-to-1 Chromebooks program. The district currently has 14,500 devices in use, mostly Chromebooks. That number will increase to 20,000 by September, including 1,300 iPads, Teuber notes. The decision to make such a large district-wide device purchase didn’t happen by accident. Teuber says Richland Two needed to fund the construction of several new schools, remodeling at other schools, and make major technology investments for those schools. A successful building referendum was put before the voters. It guaranteed funding for construction and technology, and set school officials on the quest to investigate if a robust 1-to-1 program would be possible. A major factor in the rapid adoption of the Chromebooks program and the aggressive roll-out to schools and grade levels was the creation of task force, comprised of teachers, administrators, educational technologists, parents, and “stakeholders from every school,” Teuber explains. The task force quickly visited a variety of other school systems that were embracing 1-to-1, to investigate the devices they used, the impact on the tech staff, and the benefits to students. Several lessons were learned from the Richland Two pilot, Teuber says. On the subject of cost, the Chromebooks were an attractive purchase for several reasons: the devices were only a fraction the cost of a laptop, and the district could put three to four times the number of devices into student hands. Configuring the devices was simple, and there was little maintenance required with the Chromebook. Equally important, Teuber says she had to hire two new technologists last year to maintain the devices, but estimates she would have needed to hire nine new staffers to maintain the same number of laptops. Regarding infrastructure, Teuber says the critical lesson was with regard to a robust, wide-scale wireless network, with lots of drops points in every building. The district was jumping head-first into cloud-based computing. It needed seamless wireless access for the effort to work. With such rapid investment in devices, communication and professional development took center stage. The district adopted the Technological Pedagogical Content Knowledge (TPACK) framework and Substitute, Augmentation, Modification, Redefinition (SAMR) model to aid teachers in integrating technology into their curriculum. A Google Apps for Education Summit was also held to help teachers share ideas and lesson plans. Each school also has a School Improvement Council, which gets the word out to parents on what is happening. 1. Form a strategic planning committee that includes parents as well as educators. 2. Publicize the plan as a community document. 3. Include all stakeholders in the effort--principals, teachers and support staff. 4. Organize the district within Google Apps. 5. Tie professional development to the program. 6. Start with a small pilot group for initial device rollout. 7. Assess the experience of the pilot group for program changes. 9. Expect a continuous process of assessing, improving, and implementing. Even though only two full years into the process, Teuber says Richland Two has seen significant gains in the educational experience. Students say they feel more engaged. Teachers report they feel the Chromebooks and the use of Google Apps enhance the way they teach, what they teach, and the way students learn. Teaching and learning is becoming more collaborative. Along the way, Teuber says her staff is enjoying the ability to focus on managing the transition process, and not the devices. Located in western Iowa, the Council Bluffs School District includes Carter Lake, Crescent and Council Bluffs communities. The district includes 9,400 students in 12 elementary schools, two middle schools, two high schools, an alternative high school, and a career and technical school. As with Richland Two, interest in a 1-to-1 technology initiative started several years ago at Council Bluffs. 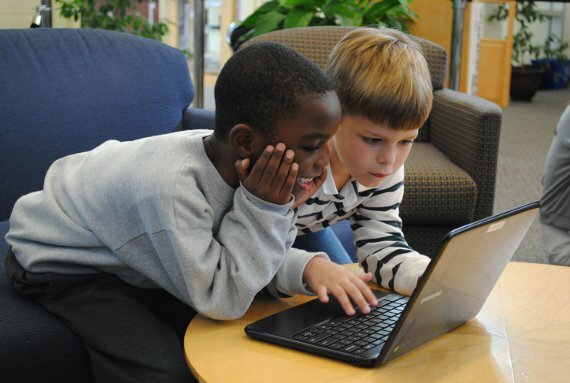 But unlike Richland Two, that 1-to-1 effort began before the introduction of the Chromebook. “In 2008, the district school board approved a new strategic plan of one portable computer device for each student in grades 3-12, though they didn’t say what device,” explains David Fringer, director of information systems at Council Bluffs. Over the ensuing year district technology leaders began exploring various devices, and were seriously looking at Linux-based laptops. Then Google called. “We have a Google data center in town. It wasn’t by accident,” Fringer says. From a device standpoint, Council Bluffs teachers were especially pleased with three features, Flinger says: that the device could turn on in only eight seconds; that the battery would last all day; and that they had keyboards. From a funding perspective, Council Bluffs benefits from a one cent state tax to fund renovations in the schools. At a cost of $279 per device, Fringer says the Chromebook was an affordable option. Staff-wise, Fringer says he would have had to hire one new educational technologist for each 700 devices purchased. With the Chromebooks, he has only had to increase staff by one. “We would not have been able to go boom-boom-boom with purchases. That would have been a bigger problem than the devices,” Fringer says of funding more staff. In fact, Fringer didn’t expect to see the budget for a 1-to-1 roll-out go farther than the high school at laptop purchase and management rates.